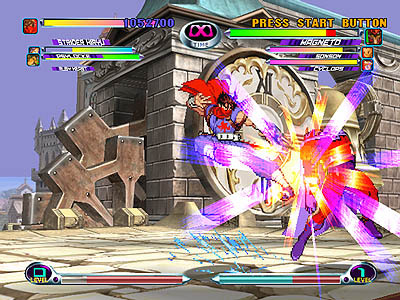 Quite possibly the closest video games have come to emulating pure insanity - you want advanced moves? How about NINE? Special moves? 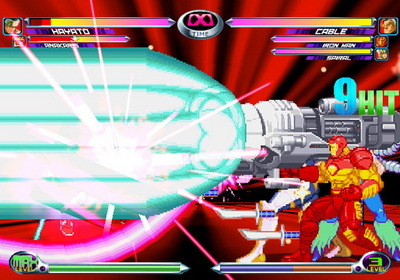 Each character starts with five, and almost all of them have additional conditions to activate in special circumstances (in-air, while it hits, while BEING hit...). 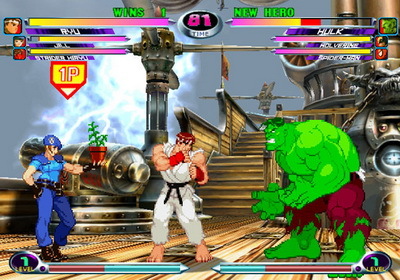 Then there's the roster - balanced and effective; Hulk not seem as dangerous in your hands as the other guy's? You've probably got a bad partner for his continuation attacks. If there are a few complaints about the game it would be that the computer is known to be a cheating jerk on the higher difficulty settings. Completing the game, even with 99 continues used, on the Hardest setting usually will get you lifetime respect. 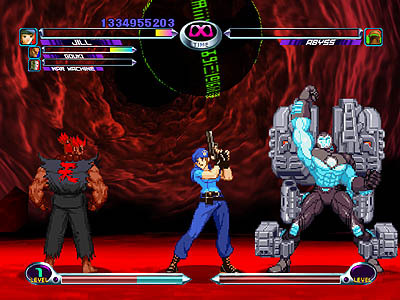 The graphics get pixelated during heavy sequences to prevent slowdown (the bane of all 2D fighters) and the super moves can have unintended secondary consequences - or combo opportunities depending on how you view them. Ultimately, this is the single greatest 2D fighter of the classic era for "twitch" gameplay - not as deep as Street Fighter III or as nuanced as King of Fighters '99-and-forward - but it's the perfect party game, even more than any Smash Bros. It's a pure, true classic. Plus, there's nothing more satisfying that beating the crap out of someone with back-to-back 99 hit combos. P.S. : I love you Mega Man, Strider and Venom. 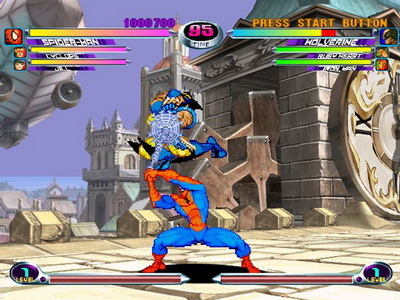 Marvel and Capcom characters unite for a final time in what is probably the best 2D fighting game on the Dreamcast, features near-arcade perfect gameplay due to the close relationship of NAOMI and Dreamcast. 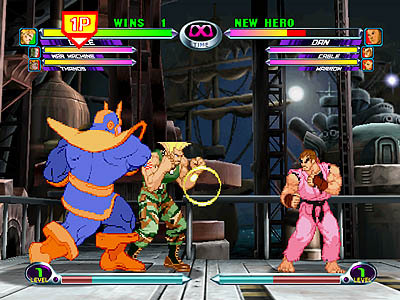 A sequel to the original Marvel vs. Capcom. This time you have 3 on 3 team matches instead of 2 on 2. 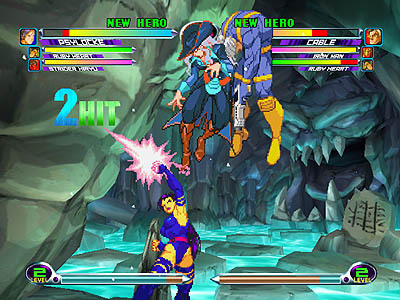 Featuring over 50 characters including fan favorites like Megaman, Morrigan Aensland, Strider Hiryu, The Hulk, Spiderman, and Wolverine, (gotta do a match between these guys sometime) this game has tremendous replay value. 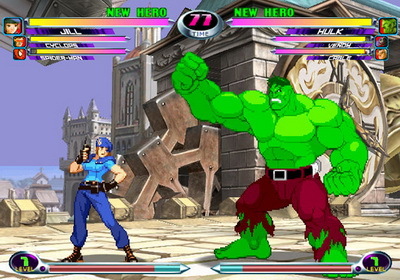 The characters themselves are 2d sprites, while the backgrounds are 3d on a 2d plane. Great Music, replay value, gameplay, and ascessibility make this a must for Dreamcast owners who love fighting games. MVC 2 was a really good fighting game, for the Dreamcast. Samsung Galaxy SM-T280 tablet. And it seldom slows down. The character sprites, do pixelate once in a while. Especially when Dr.Doom, or cutesy girl Tron Bonne, enter the battle. But it is still highly playable and is really fun to play. I rate it: 9.6 out of 10 stars. Now go buy a Dreamcast, or play it on Reicast emulator. Now you can add videos, screenshots, or other images (cover scans, disc scans, etc.) 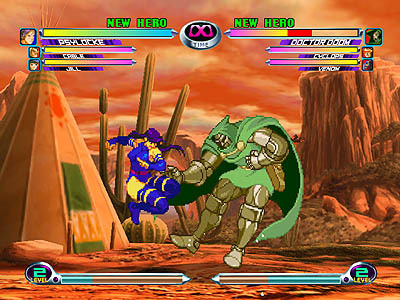 for Marvel vs. Capcom 2 - The New Age of Heroes (USA) to Emuparadise. Do it now!